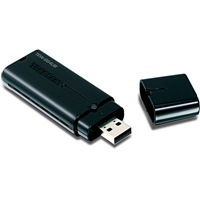 The 300Mbps Dual Band Wireless N USB Adapter (model TEW-664UB) automatically connects your laptop or desktop computer wirelessly with supercharged speed and reliability to a 2.4GHz and 5GHz wireless network. Experience up to 12x the speed and 4x the coverage of a wireless g connection*. Dual Band wireless n technology uses additional wireless channels, reduces wireless interference and optimizes performance in the most challenging environments. Setup is a breeze with Wi-Fi Protected Setup technology. Advanced wireless encryption protects your valuable data. The latest in MIMO antenna technology ensures the fastest communication speeds that wireless n technology provides. Stream HD media, download files, play games and talk online with 300Mbps dual band wireless n technology.